Ilse de Villiers was born in Durban (South Africa) and grew up in the picturesque, treelined city of Pietermaritzburg in Kwa-Zulu Natal, South Africa. She currently lives in the district of Tzaneen (Limpopo Province) surrounded by the most beautiful green hills and valleys. This is also not far from the Kruger National Park, where wildlife thrives in their natural habitat. Her paintwork began as an inspiration of her inherent passion to draw the beauty of God’s creation closer to man. Also to portray animals, so true to life, that the onlooker is left spellbound. Through the use of acrylic on canvas, she creates a new world by skillfully harmonizing wild animals with their natural habitat. The meticulous detail of her paintwork is unique to her style. 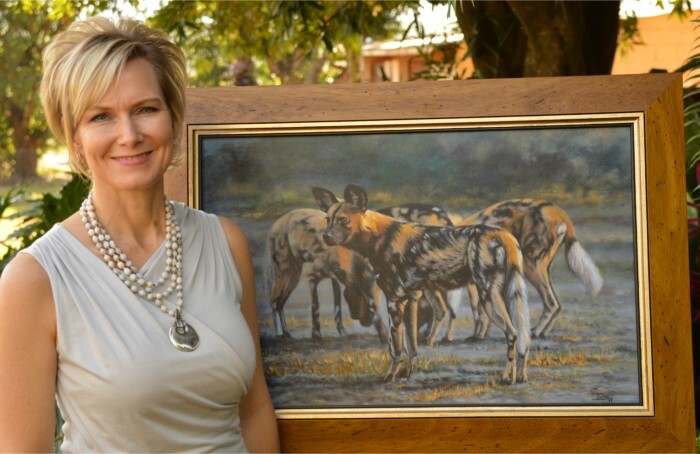 She specializes particularly in painting the “Big Five” as well as other African wildlife with zebras being a personal favorite. Paintings can also be commisioned. Described as an appealing subtropical garden town, Tzaneen is in fact the second largest town in the Mopani district in Limpopo that lies at the foot of the Wolkberg Mountains in the northern reaches of the Drakensberg range. These form an impressive backdrop to the town that is renowned for its abundant growth of just about everything subtropical – avocados, nuts, citrus fruits, mangoes, bananas and litchis, coffee, tea and cotton. Tzaneen also serves as a good spot from which to explore the rest of the region, with its position just below the Magoebaskloof. The special thing about Tzaneen is the constant change in scenery – lush vegetation, plantations, mountains and one of the biggest baobab trees in the world (at the Sunland Nursery between Duiwelskloof and Ga-Kgapane) mean that there is never a dull moment. The quaint little Tzaneen Museum is definitely worth a visit, on a day when youâ€™re not out exploring the various nature reserves or the Tzaneen Dam (also a nature reserve), for its collection of ethnological artefacts like pottery, beadwork, weapons, the largest collection of pole carvings in the country. There is also a collection of royal drums from the Rain Queen, Modjadji – hereditary ruler of the Balobedu people of the area whose succession is matrilineal (the Queenâ€™s eldest daughter is heir and males are not entitled to the throne) – whose residence is close to the Modjadji Nature Reserve. Just 17 kilometres from Tzaneen is the beautiful Duiwelskloof (devilâ€™s gorge), renamed Modjadjiskloof in 2004 in the Rain Queenâ€™s honour.